I've just read new Kray_62 posts on intel forum and intel staff answer. And seems that intel not interesting to solve eyestrain problem redirecting it to notebook manufacturer. I think about some kind of petition to intel (and maybe notebook manufacturers) on change.org (or similar platform), it could attract more attention to our problem. Great idea - let me know where to sign. Also please spread this one to UK contacts. Slacor Can you link it? Well seems like a good idea. As you know. I've started the intel thread and if many people will help to force some intel commitment it would be great. Good idea. I will gladly sign the petition. Hey. What about this petition. Maybe more of you join this thread in order that intel really will do anything. Originally I planned to buy a new PC this year, with integrated Intel graphics. But I don't know if all Intel CPUs are affected by this driver problem. Do you know of CPUs that work for you, while others don't? And what about current Intel Linux drivers? Do they have the same problems? KM Nvidia GT/GTX graphics with a 8-bit display without dithering. But I never get terrible dithering headache/eyestrain. Currently using OSX El Capitan and Windows 10 on a 2015 Macbook Pro with AMD graphics, nothing. Well. Sorry, but by the time I can't recommend you a specific GPU or any linux recommendations. so you are fine with nvidia and 8bit display? have you tried nvidia and a standard display? Harrison I've tried AMD and standard display, still the same. My father's work laptop (HP Elitebook) has Intel HD graphics but no PWM (as far as I know) and I use it just fine. As far I can gather the Mac's with switchable graphics have a Intel GPU built into the CPU and a external AMD GPU. From there the screen is connected to a multiplexer chip hooked up to both GPU's with firmware that switches the input on screen (kind of like the input select on a TV or HDMI switch) I'd be curious to see how people handle the Macbook with R9 M370X graphics and using the gfxCardStatus application. Guys...if you are the following the intel forum, there is a driver (version 4300) that intel would like us to try and provide our feedback if we get eye strain or not. If you have a laptop with Intel HD graphics, and you are getting eye strain, you should try this driver and see if it helps or not. And do post your feedback at the intel forum. Maybe intel one day will do anything if more people are complaining in this thread too. Has anyone tried the "IntelPWMControl" tool? yeah. doesnt make any difference for me. 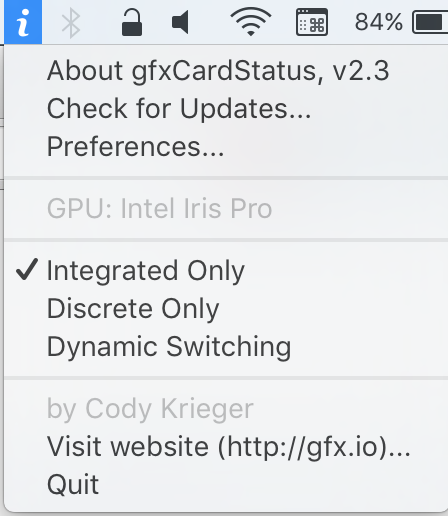 i noticed that in intel's latest graphics driver releases there is only support for 6th and 7th gen processors. Broadwell and earlier are stuck on 15.40, and maybe without hope for major changes. I have a 5500 integrated graphics on a Dell laptop and am none too happy about it.